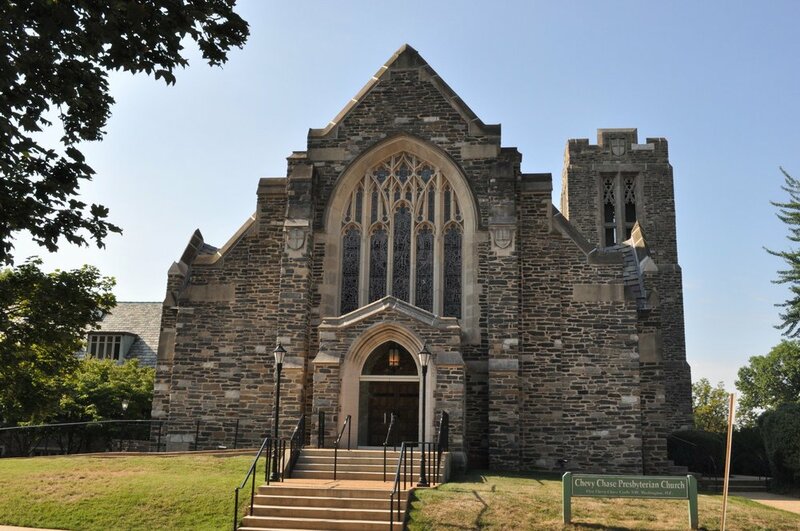 At the Chevy Chase Presbyterian Church, we welcome infants and toddlers and their parents to the Nursery every Sunday morning. The Nursery is open prior to and immediately following Sunday services in rooms 106 and 108 on the first floor, alley side of the center building. Our services are held at 9:15 and 11:15 a.m on Sunday mornings. During the Summer, (Memorial Day to Labor Day) there is one service at 10:00 a.m. The first Sundays of the month are All Church Together Sundays. On these Sundays there are no programs between the services. Only fellowship and eating together at the church family table. On 10/7, 11/18, 12/23, 12/30, 1/6, 2/24, and 4/7, there is only one service at 10:00 a.m.
HOW LONG ARE SUNDAY SERVICES? Our 9:15am service is slightly less than hour, 11:15am is one hour long. 1. Park either on the Oliver St side (with parking in the church lot on the SW corner or in the Wells Fargo bank), along Oliver St., or along Chevy Chase Parkway to the north. 2. Follow signs for the sanctuary where you'll be greeted by a member of the Usher Team who will provide you a worship bulletin and answer any questions you may have. 3. Got kids? Nursery care for ages 0-5 is available every Sunday at both services. During worship, after the Time with Children, children ages three through high school are given a chance to attend Sunday School in the Education wing (the part closest to the playground). Children are ALWAYS welcome in worship at CCPC, no matter what age or level of excitement! If you're feeling the need to step out, the Narthex/entrance area at the north part of the sanctuary, as well as Chadsey Hall available by steps in that area, provide a space for privacy for those who want it. 4. Join us for refreshments in Chadsey Hall underneath the sanctuary after worship. Shake a few hands from neighbors and make some connections. Sunday School children will be reconnected with their parents in this room as well. You are welcome no matter what you wear. We range from t-shirts to bowties, although business casual is the most common wardrobe. WHAT KIND OF MUSIC SHOULD I EXPECT? Traditional, but in the upbeat-and-awe-inspiring kind of way. Music led by our organist, choirs, and guitar group all seek to lead people into remembering the presence of God in their lives. CAN YOU TELL ME ABOUT YOUR CHILDREN'S MINISTRY? In case you can't tell, we're really proud of the part of our mission statement that proclaims "Children Our Blessing." Click here to find out more about our ministries with children.